Ezra Taft Benson clearly wasn’t a fan of civil rights and called it a communist conspiracy. But his counselor in the First Presidency, Gordon B. Hinckley, made peace with the NAACP and helped name a state holiday in Utah after King. Dr. Matt Harris tells more about Hinckley’s effects on Benson. Matt: For years, Dr. King’s been called a commie. Latter-day Saints of at least two generations grew up with this sort of thinking. So, what do you do about this? Well, when the Martin Luther King holiday was proposed in the early ’80’s, of course, the State of Utah just recoiled in horror. They can’t support the Martin Luther King holiday. The idea was, not only is he a communist, but he’s an adulterer and all the other things that these people had said about him. So, what happened was Utah decided they were going to call it Human Rights Day instead of Martin Luther King Day. There are a few other states that had gone that path, too. President Hinckley thought, “Oh my goodness, why don’t we support this? It serves no purpose in the 21st century, or as the 21st century approaches to not rename this after this iconic civil rights leader.” So, President Hinckley tells the church lobbyist, “Go up to the hill and tell them that the church supports the changing of the holiday.” It was done. And so in 2000, Utah became, I think it was like the 49th or 50th state in the union to recognize Martin Luther King holiday. What that means is that President Hinckley, yet again, is trying to modernize the church and to let Latter-day Saints know that, it’s unchristian to demean people of color and to call them a commie, and to deny them civil rights. That’s really, I think, one of, in my humble opinion, one of President Hinckley’s most enduring legacies is to really open up a new day for race relations with the church. As far as I know, because of President Hinckley, the NAACP has maintained cordial relations with the church hierarchy, because of him. He also makes some interesting comments about Sheri Dew’s biography of President Benson. GT: So, you think she purposely was told to leave that out? Matt: Oh, absolutely. Absolutely. I’m just speculating of course, but she had access to his papers and she knows how close they are. Check out our conversation, and don’t forget to purchase Matt’s new book on Benson called Thunder from the Right. My copy arrived on Tuesday and I’m just digging into it! 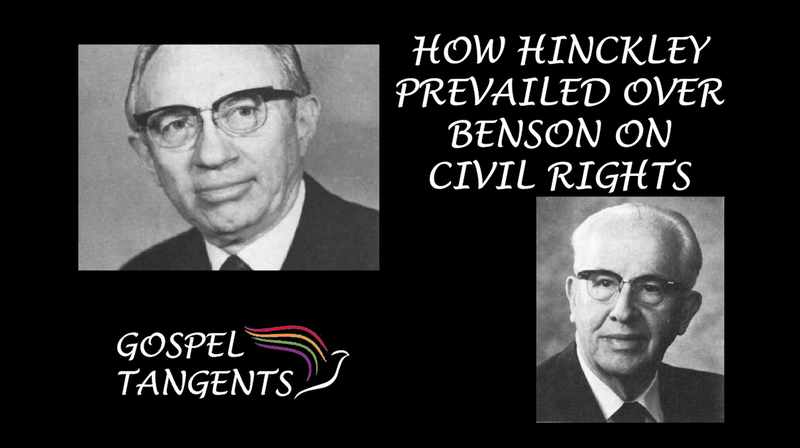 Gordon B. Hinckley made outreach to the NAACP and helped undo the harm of President Benson’s race relations. Here are our other conversations about President Benson! Ezra Taft Benson wanted to run for U.S. President. 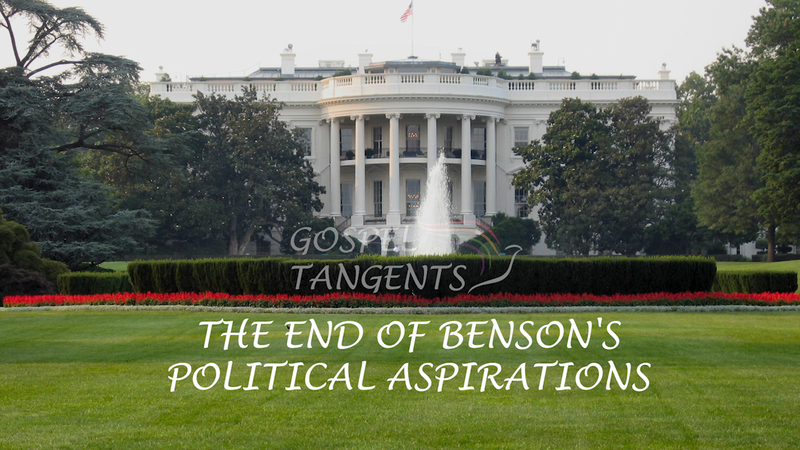 Dr. Matt Harris describes a few attempts by Benson to run for POTUS, and how Church leaders finally put an end to Benson’s political aspirations. Matt: The Birchers will create this secret organization called the Committee of 1776. It’s run by Birchers. It’s got Birch footprints all over it, but “we can’t reveal ourselves as Birchers because it’s too controversial.” And they say this in their board meeting. “If we say it’s us, then people will be turned off by it. So do not mention that Robert Welch or anybody is behind this. But it’s really mostly Birchers doing this. So they draft Benson as their presidential candidate and they draft a man named Strom Thurmond, who was a Dixiecrat in the 1940’s, and split off from the Democratic Party because he was so pro-segregation and didn’t like the civil rights tack that President Harry Truman was taking. And, without going into the details, the ticket fizzles. It doesn’t raise enough money. Thurman never had the buy-in, to be honest, that Benson had. Benson was alarmed by it and just giddy about it. President McKay gives the green light for him to do this, by the way, which is interesting, over the protest, of Hugh Brown and some other leaders. McKay is an old Scottish man. He had a little temper. “Don’t tell me what to do.” The brethren were sensitive to that, including Hugh B. Brown. So he goes back to Salt Lake and tells President McKay in a highly confidential meeting, “They want me to be the presidential candidate with Wallace.” This is on the Independent ticket because there’s a Republican Mormon who might wrap up the Republican nomination. So we’ve got two high profile Mormons running for the same office. GT: This is George Romney, right? Matt: George Romney, right. What really muddies the water is there are a number of brethren who support George Romney and not Benson. That’s another challenging issue. GT: And Marion G. Romney is in the quorum. How is he related to George? Matt: They’re cousins. So, we’ve got that dynamic going on, too. Romney has gotten priesthood blessings from President McKay, from other people about running and they tell him, “You’re going to run and we support you.” President McKay supports George Romney and tells him this. If you were’t aware, George Romney is the father of Mitt Romney. Harris tells how LDS leaders ended Benson’s political ambitions. Dr. Matt Harris describes Ezra Taft Benson’s attempts to run for POTUS and how his political career ended. Our other interviews about Benson. As you can see from our previous conversations, Mark had a tangled web of interactions. In this next conversation with forensics expert George Throckmorton, we’ll talk more about Mark’s dealings with church leaders. What got Mark in hot water with church officials? GT: He had an appointment with, I believe it was Elder Oaks, Elder Pinnock. I don’t remember who all. George: Elder Pinnock was the one that was dealing with him quite a bit. GT: Yeah. And so, so can you a little bit about what was the relationship between Mark Hofmann and Elder Pinnock? George: Business. Elder Pinnock had a history. In fact, I’ve known him. He was my wife’s bishop when we got married and so I’ve known him. I knew him for a long time before this and he was, you know, as much a victim as anybody. It turns out this Mark Hofmann was trying to give more credence to the Spaulding Theory, which states that Sidney Rigdon got a copy of the Spaulding Manuscript, gave it to Joseph Smith, and Joseph plagiarized the Book of Mormon from Solomon Spaulding. The problem has been, there has never been any connection between Joseph Smith and Solomon Spaulding. However, Mark tried to solve that problem with a forgery with a new collection known as the McLellin Collection. George: There’s an old theory called a Solomon Spaulding theory. Are you aware that? GT: I am aware of that. George: Okay. But one of the problems, it’s never been given much credibility. They think that Solomon Spalding wrote it. GT: Wrote the Book of Mormon. George: And Martin just copied the Book of Mormon, but there was really no relationship between Solomon Spalding and Joseph Smith that could be found. So, it’s not given a whole lot of credit. I mean there’s always people that bring it up, but my opinion is not given credit because they never met until too late, until this land deed showed up. And it’s a land deed that was signed by Solomon Spalding and Martin Harris. So, it showed there was a relationship between Solomon Spalding and Martin Harris and the date was appropriate. And this is the document that Mark Hofmann showed Hugh Pinnock and Al Rust and some others, and he says this is part of the McLellin Collection. Check out our conversation….and don’t forget our other episodes with George! 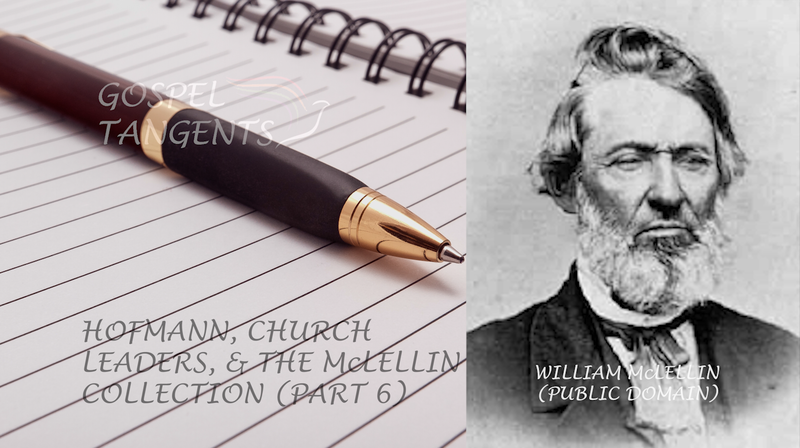 Mark Hofmann hoped his forged McLellin Collection would give credence to the Spaulding Theory. 172: Who was the 3rd Bomb Intended For? George was referring to Martin Harris, but he meant Sidney Rigdon. In a future interview with Steven Mayfield, you can see the forged land deed with Sidney Rigdon’s forged signature.